This monochrome, dream-like film by Hungarian director Bela Tar is pure poetry and has stuck in my mind since it first came out in 2001. 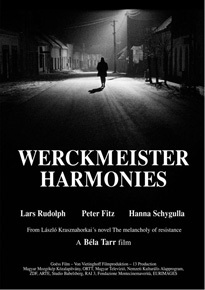 Based on László Krasznahorkai’s novel “The Melancholy of Resistance,” Werckmeister Harmonies is about powerlessness and tyranny. It is a unique film, beautifully shot with long long takes. A true masterpiece that leaves you wondering what you have just witnessed on the screen. Take a look at the trailer and opening scene below. This entry was posted in film, Movies, trailer, Uncategorised on 24th February 2015 by Chris.